Probably my wisest decision of 2017 was to take the first week of 2018 off work, so I've been busying myself with my freshly laid out sewing plans. I didn't achieved masses, but I've definitely warmed up in advance of some major-commitment coat making (more on that soon)! 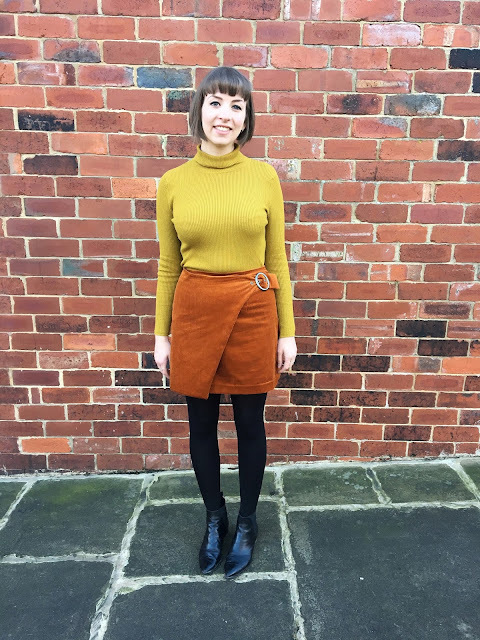 I made a Papercut Patterns Kyoto Sweater - a fine palate cleansing project - and have just finished the slightly more satisfying Simplicity 8459 skirt. The pattern is a fairly new-release from Simplicity and unlike the majority of 'Big 4' patterns, I was drawn to it because the cover version is actually, you know...nice! 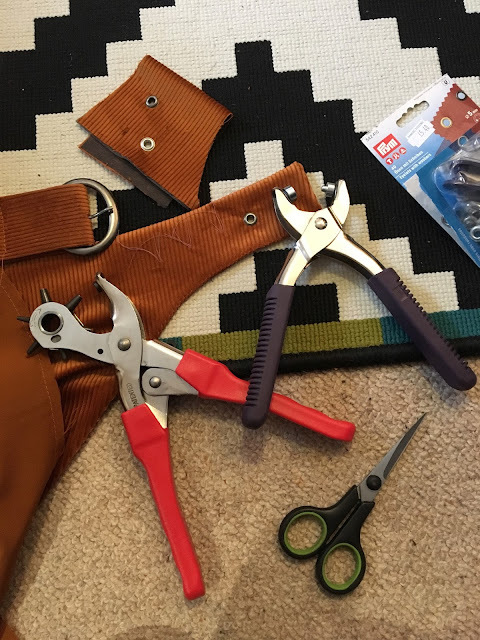 I also LOVE a project with hardware - it makes a simple make feel just that bit meatier and I secretly quite like the extra surprise from non-sewists when they found out you made it (but how you could've possibly made something with a buckle/rivet/D ring etc??). I did an order from Minerva for all the hardware. 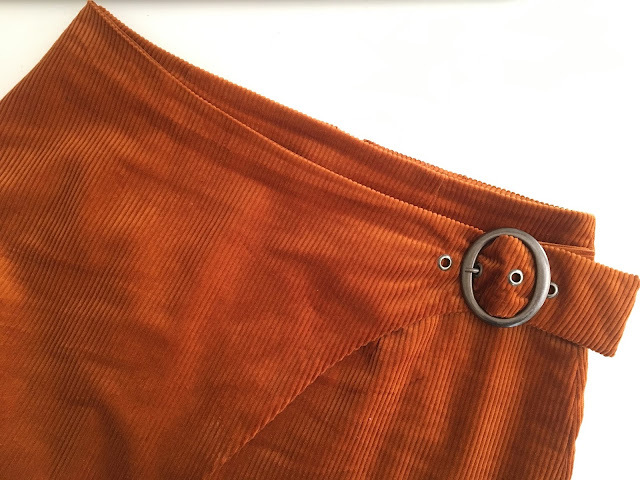 After my button hardware troubles with the Lander Pants, I'm steering clear of cheap brands for a while so I went for Prym eyelets, which come with attachments to insert them that fit the pliers I have - they also include tools for if you don't have pliers too! Options were more limited for the buckle which needs to be 2" wide to fit the front wrap piece - you could probably adjust the pattern if necessary - but I'm pleased with the oval shaped one I managed to get to match the eyelets. Frustratingly for me who hovers around the 12-14 mark, the pattern size range runs from 4-12 and 14-22, so I actually ended up buying both due to fluctuating measurements (see further down the post if you'd like my extra copy)! I made a size 12 using rust orange corduroy from Fabrics for Sale. I had ordered enough fabric for the longer version, but decided that View B would fit in my wardrobe better based on how much wear my New Look 6418 mini skirts have had. 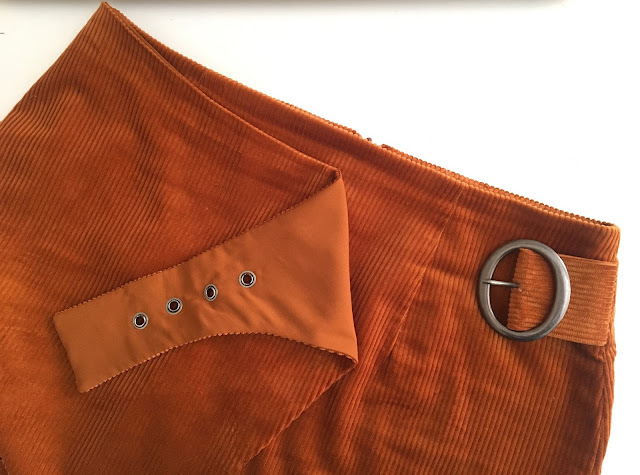 The front wrap panel is lined in a perfect-match orange viscose that I happened to have in my stash and I think I'm going to use the remaining cord to make a matchy slouchy bag. Although there is no provision for lengthening or shortening view B, I added an extra 1" to the length of my pieces when cutting as I was worried it might turn out obscenely short. And yes it is short - I'm a fairly average 5ft 6" for reference, but adding that extra inch feels very necessary. 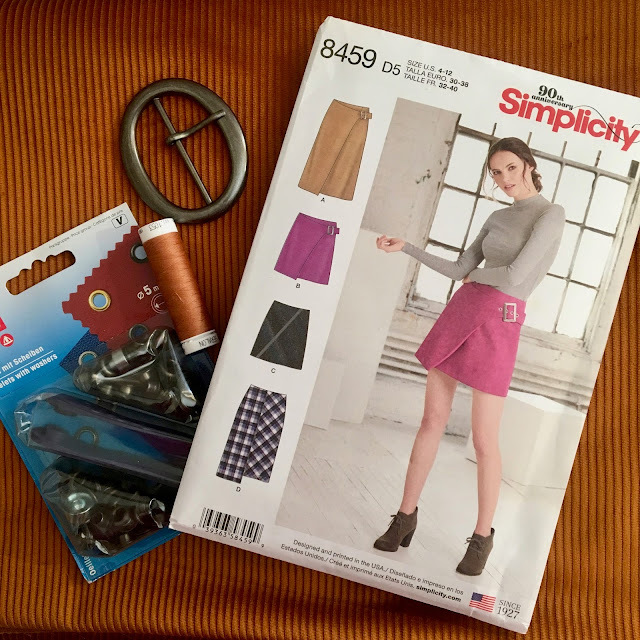 The instructions are surprisingly thorough and there's also extra advice offered for making the skirt up in leather/faux leather/suede which is really handy. 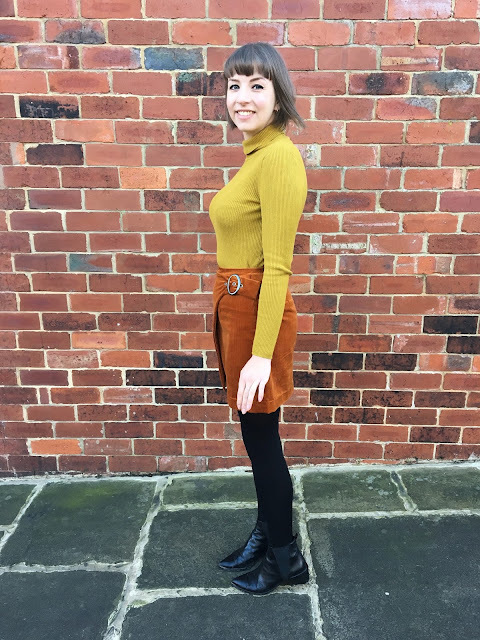 Although I like it in the corduroy, the fabric doesn't take to the rivets and buckle quite as well as I'd like, so I would be tempted to give it a go in a more substantial pleather - I wore this faux leather Nita Wrap Skirt LOADS, so there's a definite pleather-gap in my wardrobe. Whilst there's a part of me that feels a little underwhelmed by it on a whole (I think I'm just itching to get stuck back into some more serious and lengthy projects now) it is a really sweet, easy-to-wear basic. In all, it was a quick skirt to make that requires very little fabric. I might start hunting for 2" buckles now as I can see myself making it again in future. I have an extra copy of the Simplicity 8459 pattern in the 14-22 size range (pattern measurements here) to give away! 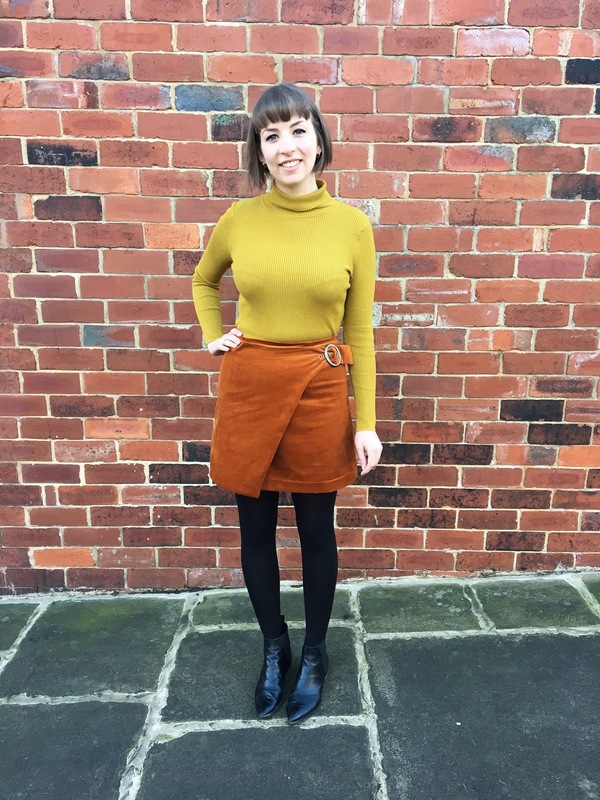 It's a cute skirt that I'm sure you'll wear a lot just as you are with a nice knit top and leggings. Why not leather rather than vinyl? You can oftentimes find a large men's leather coat in fairly good shape for sale in a thrift shop for a reasonable $ and use the leather to make yourself a nice leather skirt! I've found many over the years (typically it's the lining that's messed up and they can't be bothered to take it to a tailor to have a new lining put in) but much of the leather is still good. 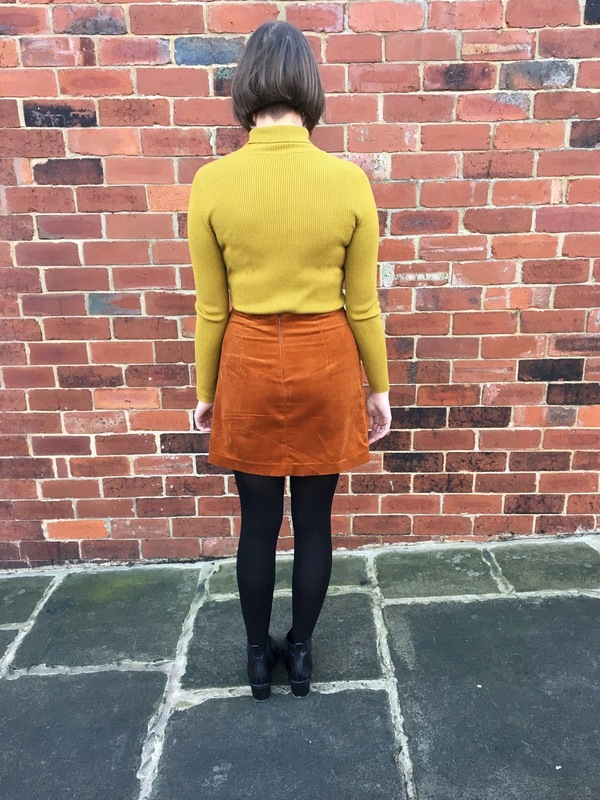 I'm loving the mild '70s vibe of the corduroy. (Mild because I'm not suddenly thinking about whether I need some platform boots in my wardrobe.) I would be happy to take your extra copy of the pattern so please include me in the random giveaway. I'm trying to organize my sewing now. I have the Lander pant pattern, but I've got a number of things on deck that I need/want to dispatch first. Hoping that a regular day in the studio will help move that along. Thanks Claudia - me too! I think it might be a side effect of making it to the end of Mad Men haha. Hope your Lander Pants work out well! I've just cut out my 3rd pair and I'm determined to get the fit spot on with these ones! I love your version and I'd love to make my own. Thank you! I'll be sure to include you in the prize draw! Thank you :) I'll pop you in the prize draw! I’d love to receive it. It’s a great little pattern. I love your version of the skirt! I didn't even catch the giveaway until after I thought "I'd like to try that pattern." And, I can totally relate with your comment on sewing projects with hardware! I'm glad that I found your blog - I enjoy your choice of projects and, especially, the results! Thank you so much! When people can't get over the amazement I always tell them about makers who sew bras or make their own shoes and then they're really shocked haha. I'll be sure to include you in the prize draw! Loving the buckle eyelet detail. Would love the extra copy so please include me in the give away. Like the idea of recycling leather coats/jackets too. Woohoo! Thank you Shauni. I have emailed you . Will be sure to include you in the giveaway! This looks great. Fab that you had such perfectly matching viscose in le stash for the lining. The buckle really elevates the make! That is a great skirt! And you've made the perfect fabric choice, I'm certain corduroy is making a comeback.